Dear readers and friends of Taiwan Sentinel: Please note that as of April 1, 2018, Taiwan Sentinel (sentinel.tw) will no longer receive financial backing from the New Taiwan Peace Foundation. Since its launch in January 2017, Taiwan Sentinel has positioned itself as an indispensable platform for timely and in-depth analysis about Taiwan and the Taiwan Strait. More than 215 original articles were published on the site during that period, and many of those were cited in domestic and international media. We thank Mr. Koo Kuan-min and the New Taiwan Peace Foundation for the generous financial support over the past 16 months, which allowed us to successfully launch our operations. As we continue our operations, we are now actively looking for new funding to ensure the sustainability and independence of our important work for Taiwan; we are associated with a non-profit organisation that can legally receive donations. Donate if you can. Sentinel has provided some great stuff and we need its voice. He said he had learned much in the seven years he was deputy mayor and hoped to do more for the city and Taiwan. “This has been my dream since my first day as a police officer,” Hou said, adding that his aspirations have never changed. 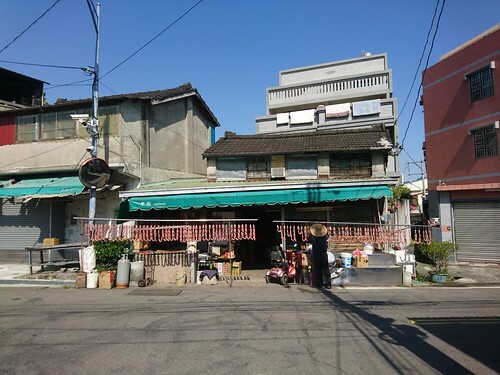 He said he would continue to propose ideas that would help make New Taipei City better, adding that he was open to suggestions from all parts of society. As this would be his first election, Hou said he knows what he is fighting for — the betterment of living conditions for residents of New Taipei City. Chu was just in China meeting the new TAO head where he re-affirmed the 1992 Consensus which says that Taiwan is part of China. I am curious to see whether his patron Hou must also make the trip across the Strait to kiss Xi's ring and recite the 1992C. That will not make him popular with local voters. Another observation: talking with a friend interested in reforming Taiwan's immigration laws, and he pointed out that William Lai is strongly supportive of liberalizing immigration. 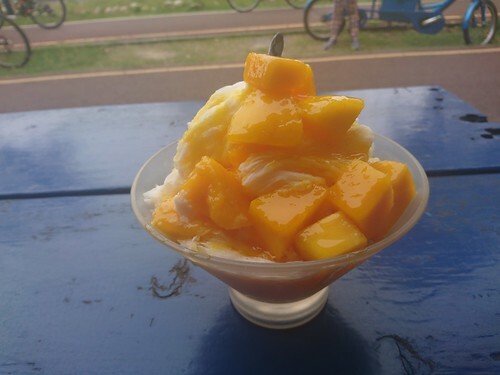 Probably, my friend suggested, because he has watched Tainan empty of its young who head off to K-town, Taichung, or the Celestial Dragon Kingdom in search of jobs. A couple of days ago, CSMonitor published a piece on how China is luring Taiwan's young. This is clearly important news, since TIME published the same idea in Aug of 2017, the NYTimes worried about it in 2016, BBC said China was land of opportunity for Taiwan's youth in 2014, and FT wrote on it in 2013. Well, this time it's different, right? UPDATE: At last, Taiwan has spoken out, accusing Beijing of deliberately fueling the brain drain. Too late. Or... the gov't could try getting businesses to raise salaries. Just sayin'. LOLOL. Reactor 2 at the second nuke plant was restarted. It immediately had to be shut down for safety concerns. 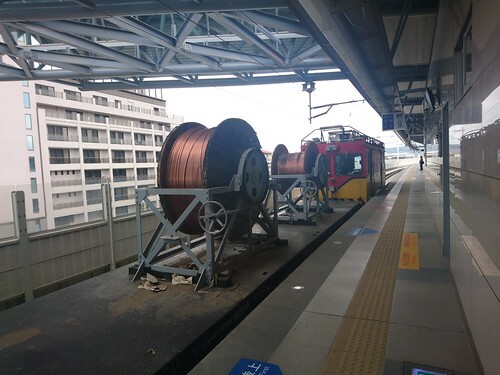 The reason that we have electricity issues in Taiwan is that our nuke plants are so unreliable, as I posted on before. Fortunately the DPP Administration is raising electricity rates next month... have to see how that affects the elections. Brian H puts finger on fundamental issue: Should Taiwan celebrate Bolton and Navarro appointments while rest of world recoils in terror? Civil groups want government to amend the Environmental Impact Assessment act because of the Shenao Coal plant mess, which is widely disliked. ZOMG Taiwan Travel Act could start a war! Or... nothing could happen. Another piece of tension-exploiting, error studded clickbait. Poor Songshan Airport, everyone wants to shut it down. Defending Taiwan against China's United Front. Another sturdy piece from the very sharp mind of Lauren Dickey. Taiwan to purchase TOW missiles from US. This is how deliveries should be handled, in small batches instead of huge sales that attract media attention and Beijing's faux ire. Meanwhile, on the Taiwan side, everyone is kicking back and downing margaritas. We don't look at events using the conventional interpretive frameworks that focus on promoting China as a serious participant in the international system and marginalizing Taiwan. We don't have to sell papers or drive clicks to our websites. And we've seen this happen a hundred times before. This month Commonwealth came out with two excellent articles on water in Taiwan, one trying to work out how a nation with so much excess water could be water-starved, another explaining the great underground reservoir system now under construction in Pingtung. Taiwan has the highest rate of precipitation of any developed country in the world, so why has it become known as a “water-starved island?” The answer, simply put, is sedimentation – silt now accounts for a third of the capacity at six of Taiwan’s 18 main reservoirs. We found more than 100 campgrounds built in the catchment area; indigenous peoples selling land to grow soil-scarring ginger; and 690 reports of activity over the past five years destroying the land, only to find that 90 percent were given the veneer of legality. Wafer foundries, along with flat panel manufacturers, have been forced into long-term contracts to “nurture” fleets of water trucks. Under the arrangement, the water trucks operate freely but can be unconditionally mobilized at a moment’s notice when needed to combat a drought. Elsewhere the waste continues. The water price for industrial users in Taiwan is NT$11 per cubic meter, unchanged for two decades. In 2015, in response to prolonged drought, the government meekly decided to campaign to reduce water use from 270 liters a day per person all the way to 250, but this was a voluntary program, not mandatory. By comparison, in the UK and Germany water use is already around 2/3 of that figure. The low water prices not only encourage waste, but as the EPA pointed out two years ago when it called for higher water prices, low prices discourage industrial recycling of water, and impede the development of new water-related technology. They also keep the water authority starved for funds, meaning that urgent infrastructure upgrades arrive slowly, if at all. A major driver of Taiwan's water shortages is the absurdly low price of water, which no party wants to pay the political cost of raising. The reckoning will come, and it will fall on the DPP, which will likely still be governing in the early 2020s. Phase one of the Greater Chaozhou Artificial Lake Project has been allocated a budget of NT$1.4 billion. 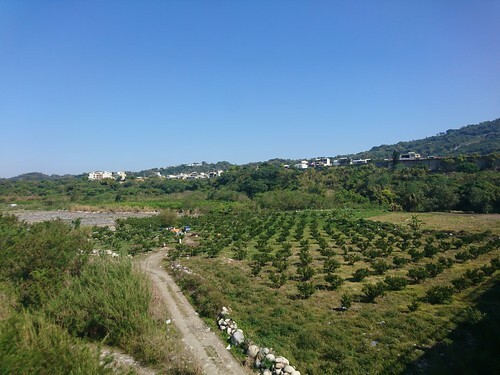 Over the past two years, trials have been run to replenish groundwater under the Pingtung Plain, and the manmade lake can be recharged with an estimated 150 million tons of underground water per year. After 10 years of replenishment, it is hoped that half of the water volume (75 million tons) can be extracted and used each year. 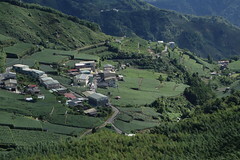 As American surveillance reports come in of troop build-ups near the Chinese coast, Taiwan’s KMT leaders are seen gathering at a secret base in the mountains. 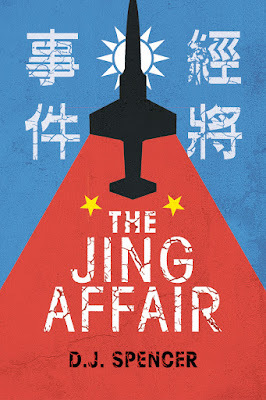 With all signs pointing to an imminent betrayal of Taiwan to China by secret police chief General Jing, the call goes out to implement Contingency Plan S; long-dormant, pro-independence Taiwanese leaders and fighters assemble in the hills, while out in the Taiwan Strait aboard a U.S. Navy carrier, Taiwanese-born air force pilot Johnny Hsiao prepares for a daring undercover mission. War comes to Taiwan on land, sea, and air. Clashes between Chinese and U.S. forces threaten to escalate into full-blown war, while Taiwanese are pitched against fellow Taiwanese. And the old tiger flag of the Formosa Republic will once more fly proudly into battle. 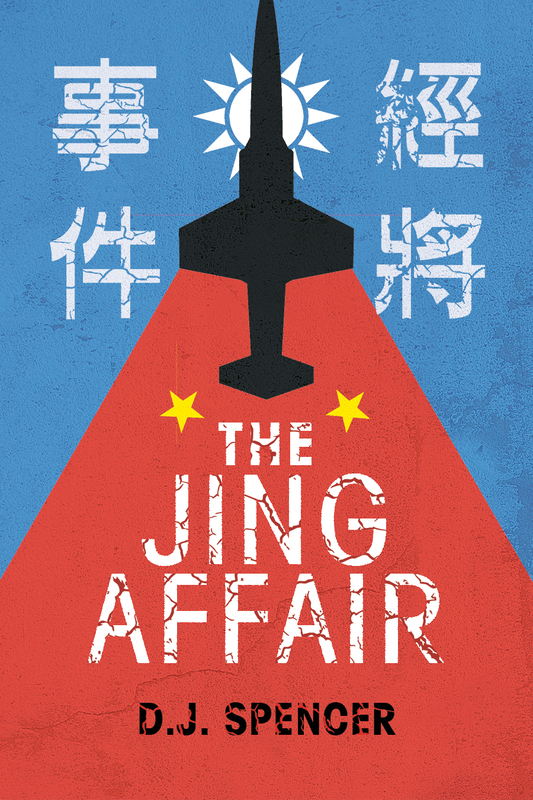 First published in 1965 under an alias, The Jing Affair is an audacious book. Dedicated to the victims of Taiwan’s White Terror, it spares no punches. The senile puppet president – the “Old Man” in the story – is a barely disguised then-president Chiang Kai-shek. The villainous General Jing has significant overlap with Chiang Ching-kuo, whom some feared would sell Taiwan out to Beijing (secret unification talks had, in fact, been held). In addition to its compelling story which I am reading in snatches since I don't want it to end, the book also offers a rich depiction of Taiwan and the desire of its people to live in an independent state, their seething hatred of the KMT, and the ethnic and politic structure of the island in the 1960s. Go thou, and read! Curing sausage the proper way, with automobile exhaust. Tumultuous couple of weeks with John Bolton, China hawk and longtime Taiwan supporter, becoming the National Security Adviser, and the Taiwan Travel Act being signed by President Trump. Those interpretive frameworks I talked about last week were out in force this week as commentators struggled to subsume the Taiwan Travel Act furor into the Establishment interpretive framework. For example, the Economist coyly suggests that the transit of the nigh-on useless Chinese aircraft carrier Liaoning and Alex Wong's visit to Taiwan were both related to the Taiwan Travel Act. Nope. As a friend pointed out, both were planned long before. This is what happens when you use the interpretive framework under which all actions are related to the cross-strait sovereignty issue. It also shows how, instead of defusing the issue by pointing out clearly that the two events were unrelated to the Taiwan Travel Act and not part of the TENSHUNZ caused by cross-strait sovereignty fights, the Economist writer cleverly exploits the Establishment interpretive framework -- it can only be part of the cross-strait TENSHUNZ -- to hype these two incidents and make them seem part of a pattern. The Economist can count on its readers to share that paradigm. Note how the final sentence is constructed to give the Economist plausible deniability. Lynch forwards a common point of view, that Bolton's views were a horror. And yet, while the US did nothing, China annexed the South China Sea. The "engagement framework" for guiding US-China relations has simply resulted in the US ceding everything to China. No one writing from this perspective ever posits the alternatives to Bolton's moves that would have resulted in a strong and credible response to China's annexation of the SCS, let alone an idea to reverse it. Instead, they write as if consideration of the idea were completely out of bounds and there is no need to say that since all rational Establishment people know that. Lynch then goes on makes a very telling error. With strong popular support, Tsai refused to accept, unlike her immediate predecessor, Ma Ying-jeou of the Kuomintang party, the so-called 1992 Consensus, a policy that proclaims both sides of the Strait belong to “one China” but that each side can offer its own interpretation of what “one China” is. It is now 2018. There is no excuse whatsoever for not knowing that China has never accepted the "own interpretation" codicil. None. So why do people keep writing it as if there isn't several years of commentary on this? The answer, once again is the interpretive framework they use to guide their understanding of the Taiwan-China relationship. The "own interpretations" is necessary because it twists reality in a way that assigns blame to Taiwan in part. Let's imagine you use the Reality Framework like many of us veteran Taiwan observers do. In this framework China is seeking to annex Taiwan. Taiwan is resisting. The 1992 Consensus never existed (reality) and the "own interpretations" claim we know, from reality, to be KMT propaganda which China does not accept. Thus, the 1992 Consensus is just a high falutin' euphemism for Taiwan accepting China's claim to the island. It actually offers only two options: surrender, or be damned. Of course Taiwan resists, since it can't do anything else. But the Establishment Framework says that Tsai has a third option: the "own interpretation". If this third option exists, then suddenly Tsai and Taiwan are being unreasonable, somewhat. Taiwan could accept the fictional 1992C and stop provoking China by being so obdurate. This enables observers to look "reasonable" and "balanced" and "centrist" (look, both sides are at fault!) when in fact they are writing fiction. At least Lynch recognizes that Tsai has gone to great lengths to avoid triggering the snowflakes in Beijing. Much of this article is good, but the framework that guides its analysis was dead and buried years ago. 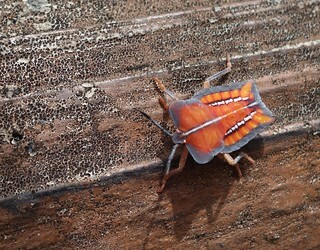 It continues to lurch forward like the amputated hand of a destroyed zombie clawing and scratching at the earth in the hope of reaching a new victim. 1. Some yammerheads in the int'l media will continue to write as if Beijing has never confirmed there is no 1992C and will continue to use the "two interpretations" nonsense. 2. Not a single international media organization will issue a public correction/apology for misleading their readers the next time the 1992C comes up. Now with the passage of the TTA, and given the recent and possibly pending personnel changes in the Trump administration, there is a very real possibility that at some point Trump might play the Taiwan card in a way that risks military conflict with China. While there would probably be jubilation in Taiwan if Trump were to radically upgrade U.S. relations with the island nation, it would be wiser for Tsai to resist the temptation to accept such a change. She should recognize that doing so would turn Taiwan into a pawn in Washington’s struggle with Beijing. The Trump administration is too unfocused and chaotic to be a reliable partner, and Trump’s nativist political base would likely reject the United States going to war on Taiwan’s behalf. Taiwan would best be served if Tsai were to return to her cautious roots and keep Taiwan’s comprehensive, long-term security foremost in her mind. There is so much to unpack here. For one thing, Taiwan is already a pawn in "Washington's struggle with Beijing" and except for capitulation, nothing Tsai can do will change that. For another, Lynch, like so many using the Establishment Framework, does not consider what upgraded US relations with Taiwan might mean for Japan (and SE Asia nations resisting Chinese expansionism). The Establishment Framework simply views the problem as a Beijing-Washington-Taipei issue, other nations do not exist. The Trump Administration might be unreliable, but the foreign policy establishment in DC will still be there after Trump -- knowing that, they will resist major change, which is why the "Taiwan Card" whatever that may be, will never be played. Finally, the US is at war all over the world, including its longstanding and insane attempt to pacify Central Asia for Chinese expansion, and Trump's base has not revolted. Why would it in a war against China? Lynch's advice, though, is classic: Taiwan must suppress its own space. Whatever the issue is, that is what Taiwan must be doing. Surely, in the unlikely event that the US offers upgraded relations, some compromise can be found. Tsai’s rejection of the 1992 Consensus angered Beijing, which responded to her defiance by cutting off hotline communications and inflicting a degree of economic pain by sharply reducing the number of Chinese tour groups allowed to travel to Taiwan. Because of this paradigm which says that China must have been punishing Taiwan for the heinous crime of electing Tsai Ing-wen and provoking Beijing, nobody ever asked whether Beijing was peeved at its supporters in Taiwan, or whether the tour group cut off was related to something in China and Taiwan was a convenient excuse. For example, in Dec of 2016 the head of the Taiwan Affairs Office in China was charged with bribery. Surely the investigation had been going on for some time. Readers may recall that Taiwan local media had reported that the tour group companies were close to the Taiwan Affairs Office. Readers may also recall that the independent tourists were not cut off -- just the tour groups. The interpretive frameworks observers use to understand the cross-strait relationship are boxes that too many people never learn to think out of. Congratulations to long time friend Amb. John Bolton on his appointment to be the President's next National Security Advisor. I've had the pleasure of working with John since the 90s as colleagues at conservative think tanks, in the Bush Administration, and at Fox News. In this day and age I know how easily public figures are reduced to simple categories and labels. All I can say is that from long experience I have found the breadth of John's government service and depth of his intellect to defy simple labels. The President has a strong, professional, experienced, conservative as NSA, and I am grateful for that. Here is Bolton on Youtube last year talking about Taiwan. I really don't have much to say, except that let's not forget -- there are plenty of people inside the government pushing in all sorts of directions, and Bolton's expressed desire to bomb N Korea is going to get pushback. Bombing North Korea would be a pointless, stupid act, and could well result in.a US war with N Korea which would be the greatest victory in Chinese history, very bad for Taiwan. Let's hope Bolton is just making noise. The KMT says that DPP New Taipei City mayor candidates must declare their views on the Shenao Coal plant. The KMT is actually attempting to make the environment an issue in the election. How can tariffs hurt Taiwan? Here's one way. And more! Economist thinks Liaoning transit and Alex Wong visit both related to the Taiwan Travel Act. Nope. Both planned long before. Our government is owned: Wilbur Ross, Commerce Sec'y, invested in China shipping. Joe Biden and Mitch McConnell, McConnell especially. Project 2049: "U.S.-Taiwan Relations In a Sea of Change: Navigating Toward a Brighter Future,"
Does int'l media get sore arms from carrying so much water for Beijing? 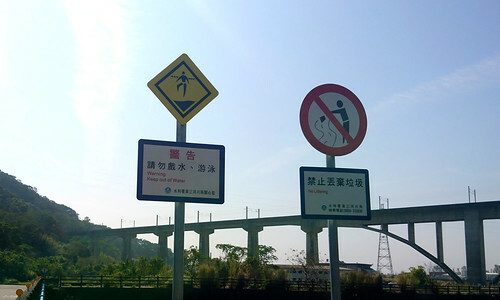 The sign on the left sign cries out for captioning. Yesterday President Trump of the US signed the Taiwan Travel Act. The act is simply a "sense of Congress" resolution and does not require anything; the President already has the power to order officials to Taiwan. But it is an important symbolic move (see Shannon Tiezzi's sturdy backgrounder at The Diplomat). I have yet to read any US coverage that explains why strong, high-level US-TW engagement is inherently in the interests of the US. Only a steady stream of why the PRC is upset. Note to America’s media - US interests should not be dictated by China! Hammond-Chambers instanced this piece from Reuters. Note that while it expends many pixels explaining that China is upset and permitting Chinese officials to speak without any challenge or contrary information, it says nothing about why US officials think this might be a good idea for the US. The US, indeed, is not given any voice whatsoever. Reuters has appeared many times on this blog for its reporting on China, but it is hardly alone. U.S. President Donald Trump has signed legislation that encourages U.S. officials to travel to Taiwan to meet their counterparts and vice versa, a move that has angered China. The piece contains no information on why the US did this. But the key fact that it angers China (ZOMG TENSHUNZ PLZ CLICK MANY TIMEZ) is reported and Chinese officials speak with no challenge or contrary information, and no words from US officials about why they might be doing this. Yes, in Voice of America, America has no voice. In fine reader-slit-your-belly fashion the "report" even uses the word "reunification". The AP piece is better. It gives context but the bulk of the report is still devoted to China and the Chinese reaction. Chinese officials are quoted twice (no US officials are quoted but at least AP notes Trump wants to get tough on China). As usual, nothing is presented that might show why China's claims are nonsense -- no argument is made for the US side, and the reader is not alerted to the key fact that China's policy is to displace tensions in the US-China relationship onto the US-Taiwan relationship, to weaken the latter and present Taiwan as the cause of tensions. Tsai is presented as refusing to endorse China's claim to Taiwan, but the US position that Taiwan is not part of China is omitted. Who gave American officials a voice? NHK of Japan, which not only gives a US context but also offers words from a White House official. Sputnik even quotes the actual WH press release. This media response is driven by two issues. One is the vast contempt the media has for Trump, so anything Trump does is deprecated. The second issue is the interpretive framework that establishment observers use to understand China's place in East Asia geopolitics and which journalists reflect. In this framework the goal is great power "stability" under which China participates in international economic and political systems as a full compliant partner. This framework denies that China is interested in subverting, overthrowing, converting, or destroying the international order and views Taiwan as a provocative irritant that upsets the smooth ordering of international relations -- tensions are due to the actions of Taiwan, not China. Its proponents thus argue that if we only understood China better and addressed its concerns, it would respond positively. These worthies claim that opponents don't understand poor put upon China and, when necessary, that those of us who constantly point out that this framework is both useless and pro-China are paranoid or are just plain racist. This difference in underlying interpretive frameworks is why the China Explainer crowd gets so worked up about Taiwan-US contacts -- the classic example being the Trump-Tsai phone call (my post on that is now the #2 most-viewed post on this blog) -- and why those of us with Taiwan experience, who do not use this pro-China framework when interpreting Chinese actions, shrug and ask for another margarita because nothing is going to happen, and alcohol makes the conniption fits of the China Explainer crowd even more enjoyable. But more seriously, which media outlet reported that nothing happened as a result of the Phone Call? That would be none. Failures of the Establishment Framework are passed over in silence, and its links to the power, status, and wealth its proponents derive from their China connections are never mentioned. However, establishment journalism well understands how to exploit this framework to sell clicks. For example, earlier this month AP shouted: Get yur clickbait here! The international media sells tensions, and when Beijing-Taipei tensions are normal and unremarkable, they need sexing up. Thus, this recent AP piece on the scammer deportations ruthlessly exploits the interpretive framework under which the pro-democracy party in Taiwan is the cause of tensions: "Phone fraud schemes worsen Beijing-Taiwan tensions". It's important to get in those words "worsening... tensions" to maintain the proper level of clickbait appeal. Imagine if the headline read the truth: "Phone fraud deportations reflect fallout from the currently normal level of Beijing-induced tensions." In 2014, Philippine police nabbed 44 Taiwanese who were suspected of gaining access to bank accounts by telling victims they had been used by money launderers or terrorists. Other cases have involved fraudsters posing as tax collectors or other officials. As of September, the Taiwan Criminal Investigation Bureau said it was tracking 778 people and 58 groups with potential fraud links. Shortly before Tsai took office, Beijing began demanding that governments of countries like Kenya, Malaysia and Spain that arrest phone and computer fraud suspects send them to China, where they face almost certain conviction and up to life in prison. In December of 2014, the Kenyan police arrested 77 persons (45 Taiwanese, 31 Chinese, 1 Thai; 13 of the the 77 were females between 19 and 25) following a fire that revealed their equipment. They were tried in several different groups. One of group of 10, including the batch of eight Taiwanese, was convicted of being in Kenya illegally and did a year in prison, which ended in March 2016. They were all eventually tried on three charges of telecoms equipment violations and business violations. All were acquitted of the latter. As the Kenya government later explained, the men were deported to China because they had entered the country illegally, and Guangzhou was their last port of embarkation. China became involved immediately. In December 2014, a police team arrived from China to help investigate the case, and in January 2015, the Chinese government formally requested that Kenya send the suspects to China. China wanted to try the suspects on fraud charges, while the Kenya government tried them only on telecoms equipment and business violations. This withholding of the fraud charges suggests that the two governments agreed on how to handle the case over a year before Tsai Ing-wen was elected. It is thus highly unlikely that the Chinese government was planning to signal the incoming DPP administration on cross-strait sovereignty issues. The construction that AP presents, "shortly before Tsai took office" appears to link the "new" policy to Tsai without actually saying so -- that pro-democracy party, so unstable you know, wink wink. Cute. Taiwan officials protested when a court in Spain agreed in December to send 121 Taiwanese fraud suspects to China. Beijing contends that since victims of the crimes are Chinese, the suspects should be tried in China. To impress domestic audiences, Taiwan officials protested when a court in Spain agreed in December to send 121 Taiwanese fraud suspects to China. However, the Ministry of Justice publicly conceded in 2016 that Beijing has the right under international rules to try the suspects since the victims of the crimes are Chinese. But then such a construction is tension-free because it concedes that in this dispute China is right. But to understand that, you'd have to understand why China is requesting them, which AP completely omits. The AP piece does, laudably, assign blame for the breaking off of communication to Beijing -- the international media is getting better at that. Reality: the cause of tension between Taiwan and China is Beijing's desire to annex Taiwan. But what media ever straightforwardly says that? 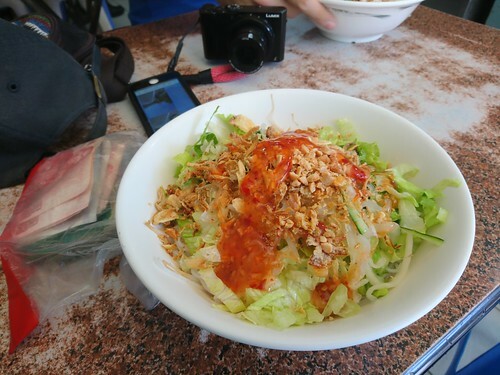 So many Vietnamese wives imported into Taiwan means good Vietnamese food is available even in the smallest towns. The [KMT] government in Taipei is clearly attempting to stoke the Diaoyutai issue at home, to drum up some faux nationalism and to divert attention from the many problems the economy is facing. During recent exercises the military wore patches saying "The Diaoyutai are ours!" (DefenseNews). In the most recent exchange of water cannon fire between ROC coast guard vessels and Japanese ships, Chinese ships were hanging around. The two sides probably aren't actively coordinating, but of course they don't need to. Everyone knows the score and knows how they should behave. Chinese Nationalist Party (KMT) Vice Chairman Hau Lung-bin (郝龍斌) yesterday turned over 18,750 signatures for a referendum drive to the Central Election Commission to back a call for a referendum on boycotting food imports from Fukushima Prefecture and four surrounding Japanese prefectures that were affected by the Fukushima Dai-ichi nuclear power plant disaster in 2011. “The number of signatures is tenfold the legal requirement. It symbolizes the public outrage directed at the Democratic Progressive Party [DPP] administration,” Hau told a news conference at the commission’s office after presenting boxes containing the signed pages to commission official Chuang Kuo-hsiang (莊國祥). The KMT has long attempted to use food issues to present itself as the party of the people against the DPP. In the 2016 election, for example, KMT candidate Eric Chu used the ractopork issue to attack the DPP. After Tsai won, this tactic continued. This current referendum drive thus serves the double purpose of irritating relations with Japan while hacking on the DPP. Note that further down the Ag Minister points out that if Taiwan were to join the CPTPP it must comply with the norms of CPTPP states, and importing ractopork and radiated food is one of those norms. This move to irritate Japan is thus also, but more quietly, directed at this successor to the US-led TPP, which was revived by Japan. When Taiwan joins an international agreement system, it is good for Taiwan but bad for China's drive to annex Taiwan. Taiwan joining an international agreement led by Japan would be especially infuriating to the pro-China KMT. 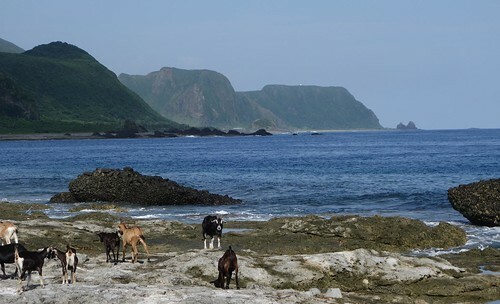 Tseng Tai-shan (曾泰山), chairman of the association, told CNA that the Taiwanese recreational fishing vessel did not intrude into Japan's territorial waters and accused the Japanese side of going too far in its reaction. "We hope that the government will be tough this time in dealing with Japan in order to ensure the interests of Taiwanese fishing boats." The fisherman called upon the government to get tough with Japan, which would certainly cause more trouble. This is not the first time that Tseng has been involved in this sort of thing -- in 2013 he was part of a call for a lawsuit against Japan over the Senkakus. And that same boat has been chased before, according to the report above. Fishermen have a special place in Taiwan hearts and there is much sympathy for them, a hidden reason why the fleets are never reformed or well regulated. Recall the outpouring of public support for the tuna poachers shot by Philippines coast guard in 2013. Few voices in the media asked about Taiwan's long history of poaching in those waters, instead blaming Phils. Luckily, one of the Tsai Administration's skills is keeping silliness like this under control and not letting it affect Taiwan-Japan relations, which (also fortuitously) have deep roots. Fruit trees line the dry shelf next to a river. l'll talk to this Humungus! He's a reasonable man, open to negotiation. He promised us safe passage! He gave his word! And let us suppose he keeps it and we walk away from here with our lives. What then? Sorry, but haven't felt much like blogging lately... first few weeks of the semester are busy ones. So I come home last week and my son meets me at the door. "Hey, I am graduating," he says. "I never doubted it," I answer. "No, I mean today." Turns out the school recalculated his credits and decided he had, in fact, graduated. He picked up his diploma and is now degree'd, and we save a semester of tuition. Off to the army for him! That should offer some excellent blogfodder, so stay tuned. Bet you haven't even noticed: where is Wang Jin-pyng, former head of the Taiwanese KMTers and powerful KMT politician? Don't worry, I don't know either. Given the official title of “Favorable measures for Taiwanese” (惠台措施), the CCP propaganda reads that this is merely an offer to put Taiwanese citizens on a par with China and enable them to “share in the benefits of China’s economic development.” They have been compiled by no fewer than 29 different CCP government agencies and, in keeping the with cult of personality currently being built around the CCP leader, they are being billed as "the vision of Chinese President Xi Jinping (習近平) regarding Taiwan." That is not something that will be particularly enticing to Taiwanese people who are not subjected to nearly as much Xi propaganda as the Chinese. But you also do not have to be much of a cynic to see through the spin and interpret the 31 initiatives for what they really are; namely a transparent attempt to try and win support for the CCP from Taiwanese people and to draw talented people and investment money away from Taiwan and, in doing so, exacerbating Taiwan’s brain drain issue and create new economic challenges. Spencer's call for economic changes in Taiwan in the following paragraphs is dead on. However, the second paragraph is only halfway right. It is a transparent attempt, and it will not be "successful" because Taiwanese are already going there to make money. While many go, few support the CCP or eventual annexation to China. These 31 incentives are not really aimed at Taiwan, though some positive fallout is probably expected. The CCP knows perfectly well that it has zero popularity on the island and that these incentives are transparent. They are primarily aimed at two audiences. First, the audience of international China observers who are still operating under the dead interpretive framework of China's inexorable rise and inevitable annexation of Taiwan and always-just-around-the-corner entry into the international system. They will no doubt point to these and say "LOOK TAIWAN IZ DOOOOOOOOMED" by China's irresistible pull or some such drivel. Fortunately this viewpoint, lucrative and status-enhancing though it may be for its purveyors, is slowly vanishing. All of Taipei's Michelin Restaurants in one guide. This is an extremely useful guide. Now you can know which restaurants will be packed, and will suffer significant drops in service and food quality, and so can avoid them. Thanks, News Lens. John Bolton, longtime Taiwan supporter, is likely to be next National Security Advisor. He really wants to bomb N Korea, which would be China's greatest victory. Attacking N Korea is a move stupid beyond belief. Japanese commentator in TT on Taiwan's illicit exports to N Korea and how Taiwan should enter an int'l control regime. Note that the presence of Taiwan tech in N Korea may simply be re-exports from China. Could Taiwan remove the dictator and mass murderer Chiang from its banknotes? The perennial battle over illegal fishing and slaving by Taiwanese skippers continues. This piece on slaving aboard Taiwan's boats is painful. Fourth Nuclear Power plant fuel rods shipped back to the US. 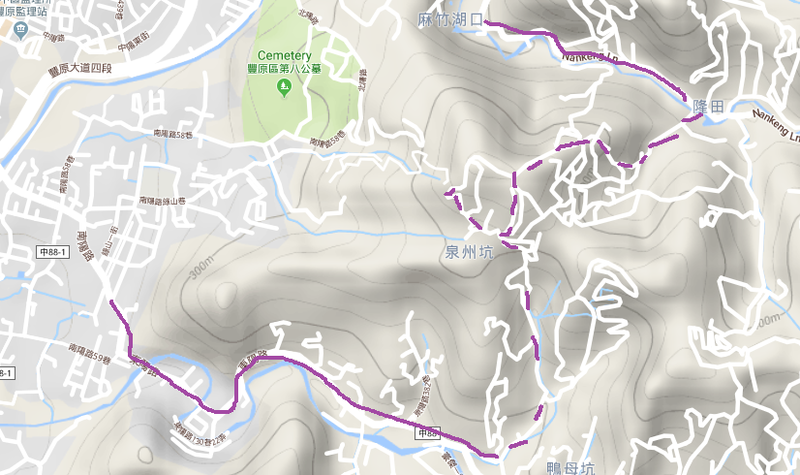 "The latest move by Taipower means there is almost no chance of a nuclear power reactor operating at the plant which is located in Gongliao, New Taipei." Meanwhile the second nuke is going to be restarted. The government says it is still on track to kill all nukes in Taiwan by 2025. Training center for wind farms to be established in Taichung. The port in Taichung is being built up as a wind power port to service the wind farms being built off of Changhua. Controversy: Taipower wants to expand coal power in N Taiwan, but locals oppose. Stupid to build more coal plants. The money should be spent on solar, wind, and geothermal power. Brian H at New Bloom has detailed look at the issue. 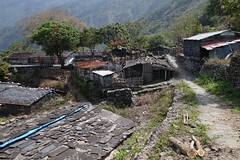 It's the usual sordid indifference to strong local opposition, high-handed lack of communication, commitment to policies based on authority rather than need with little regard for the environment, and similar, that have characterized the government's interactions with the locals here. NPP's Freddie Lim says DPP tried to recruit him, but Lim rejected them. DPP not serious about air pollution, says KMT. You have to admit, when it comes to not being serious about air pollution, the KMT has considerable expertise. An eagle soars above us. It was sitting on a pole, but when we stopped to get a close up a dog came out of a nearby house to bark at us, and scared it off. With the Daybreak Project Brian at New Bloom has outdone himself gathering a pile of materials on the Sunflowers and then conducting interviews with numerous key individuals and observers. Go thou and read!! Sometimes you find yourself on an amazing, lovely ride when you least expect it. 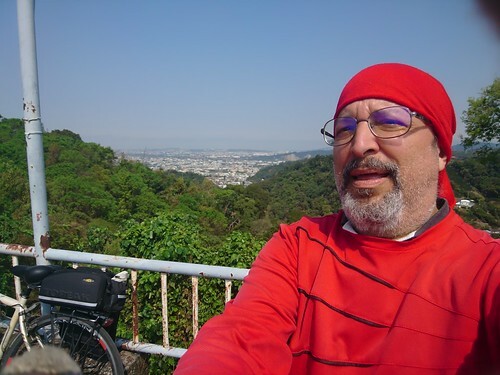 The other day Mike Surly and I were off to climb the 88 (Dongyang Road out of Fengyuan) which is a pretty climb with good views and an excellent workout. But we'd done it 100 times so we started exploring some of the side roads off the 88 instead. 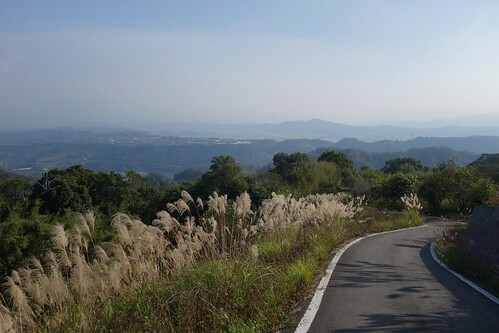 Eventually we turned onto Quanzhou Road, which offered lovely terrain combined with fearsomely steep climbs. We ended up walking some of the climbs, but it was well worth it. 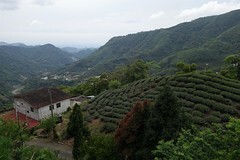 A good reminder of how many beautiful places there are within a stone's throw of Taichung. The awesome and insightful Kerim Friedman with a Twitter conversation with Taiwan's digital minister, Audrey Tang. Twitter is great for conversations like this, you can talk directly to the people you want to reach... on a topic that we foreigners have been complaining about since the introduction of computers: none of the systems used by government and major SOEs takes foreign visa numbers. Local ID numbers begin with 1 English letter, ARCs with two. A typical Taiwan ID looks like F0000000000, a foreigner one TX00000000. Many systems won't accept the latter number since you can only input 1 letter. This has been the source of much friction for us in the foreign community in Taiwan since we can't purchase stuff online or at 7-11. @audreyt Hi, I'm a permanent resident of Taiwan, but still can't use any of the available APPs to purchase Taiwan Rail tickets online because I don't have a Taiwanese ID number. No such problem with HSR. What can be done to improve this? I've lived here for 12 years and take the train almost every week. I know how to use the website. What I'm asking is why I can't use a mobile app which has numerous advantages: see what trains are booked, save my information for reuse, etc. only because my ID is different? Nor is this the only site for which this is true. There are numerous online sites in Taiwan that require a 台灣身分證 simply because the programmers have been too lazy to code to check for alternative IDs such as ARC numbers (which are formatted differently). Taiwan is much better to immigrants than many other countries, but it is one of the few countries which discriminates in this way. For privacy reasons the US won't even let you use your SSID online, but if they did, the number would be the same for foreigners and locals. Getting back to 台鐵. Taiwanese can book tickets at 7-11 store using iBon, but if you don't have a 台灣身分證號碼 you can't do this as a foreigner. (Although you can print out tickets that you bought via the website.) This seems silly. 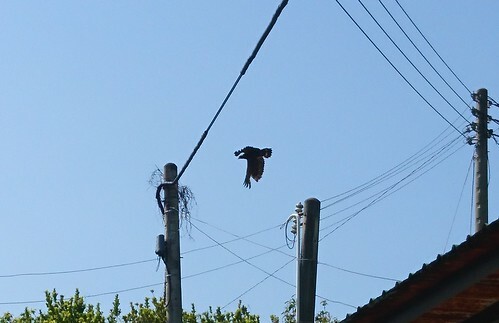 高鐵 does not have these problems. I think in the past this kind of thing didn't matter so much because most migrants had a Taiwanese spouse who would do these things for them, but in my case we are both foreigners and so we are shut out from many online conveniences that only Taiwanese can take advantage of. Indeed. For government services, at the moment this requires explicit regulatory changes ( for example recently we're expanding http://join.gov.tw participants, which needed to amend https://talk.pdis.nat.gov.tw/t/directions-for-implementing-online-participation-in-public-policy/5166 … — expanding "citizens of the state" to include folks with ARCs ). Thanks for looking into this. I understand that there are some services that are restricted to citizens, but in most cases it just seems like lazy web development, since the service is (or should be) available to all. In such cases perhaps there could be incentives to fix this (akin to those for web accessibility)? Unknot thy knickers: there will be no independence referendum. It was warm, so this was necessary. Meanwhile the amazing news this week was that Taiwan Launches Campaign For Independence Referendum. No, haha, not "Taiwan". There was so much silliness because the I-word was mentioned. On Twitter a China observer commented that this should be watched because it is what a run-up to war looks like... tenshunz, you know. Several of us laughed and explained that Taiwan's referendum law specifically rules out referendums on the status of the nation, the national territory, the Constitution, and similar. Former Taiwanese presidents Chen Shui-bian and Lee Teng-hui have said they support a bid for an independence referendum to be held next April. Lee said a vote would be the “most powerful weapon” to ensure the island nation is respected as a “normal country,” with a new constitution, under the official name of Taiwan. “I attended the press conference today as a concrete action to show my support for the referendum,” Lee told pro-independence supporters on Wednesday, according to the Central News Agency. The Island of Joy and Happiness Coalition (喜樂島聯盟), launched by Formosa TV chairman Kuo Bei-hung (郭倍宏), was joined by Lee, former president Chen Shui-bian (陳水扁), former vice president Annette Lu (呂秀蓮) and former presidential adviser Peng Ming-min (彭明敏), as well as the New Power Party, the Taiwan Solidarity Union, the Social Democratic Party and the Taiwan Radical Wings. At a news conference in Taipei packed with hundreds of independence supporters, coalition representatives announced plans to formally launch on April 7, the anniversary of late democracy activist Deng Nan-jung’s (鄭南榕) self-immolation in 1989. Anyone see what wasn't in the news? That explosive reaction from China? Oh yeah, it never happened. But you can be sure that the China watcher crowd will pass over that silence in... silence. UPDATE: A friend who was there said this protest was only about protesting the referendum law that does not permit referendums on independence. Note that (1) all the groups present are part of the third force political movement and (2) it is highly critical of President Tsai and the DPP. THE DECLARATION by Third Force parties, along with former presidents Chen Shui-Bian and Lee Teng-Hui and other influential figures such as former vice president Annette Lu, former DPP presidential candidate Peng Ming-min, and Formosa TV chair Kuo Bei-hung, that they intend to seek a referendum on Taiwanese independence poses a significant challenge to the DPP. Namely, with this move, the Third Force has more or less declared its intent to seize the mantle of traditional positions held by the DPP away from it. Brian provides a detailed discussion of the internal politics of the third force (which you should read), but the key point is that despite its internal quarrels, the alternative social groups/parties presented a unified front on this issue. My man Donovan and I predicted that this sort of thing would happen in our analysis (points 6 and 7) shortly before the 2016 election (we were hardly the only ones). Fundamentally, the DPP is a big tent party with a large pro-independence base that is very conservative, and it has close links to big businesses. As the KMT is crushed, that leaves space on the pro-Big Business right which the DPP will fill -- business groups donated more to the DPP than KMT in the run-up to the 2016 election (thus a double whammy for the KMT, on the one hand losing its assets, on the other, businesses stop donating. Hard for the party to recover). With the gravitational pull rightward, the DPP will shift to the right, opening space to its left which someone will try to fill. That is what the third force is attempting to do. At some point, Donovan and I have long felt, the DPP will probably fracture into pro-big business and pro-society, small business groups, especially if the KMT shows no signs of recovery. The DPP's base understands the DPP is pro-independence even if it does grumble about the slow pace of independence. But recall that the DPP has done nothing on gay marriage, has made lots of noise about drugs, and similar. Its base, especially in the South, likes that. The third force is more progressive than the DPP base, and the DPP base knows that. Hence, this will go nowhere. Also note that except for the NPP politicians, the big names listed in the Taipei Times piece are mostly from the previous generation of Taiwan Independence activists. For that generation Taiwan Independence was about getting rid of KMT colonial power. The current generation of under-40s in Taiwan is a post-independence generation -- Taiwaneseness, independence, and democracy are the bedrock of their social identities. Their decision on independence has been made and they are concerned with pressing environmental, social, and economic issues. Against that, holding referendums on independence amidst calls for Taiwan to assume its place in the world is actually engaging in the politics of the previous generation. If the third force wants to poach the DPP base and appeal to the rising bloc of under-40 voters, it would be better off pushing loudly for issues involving the environment, jobs, salaries, child care, and the social safety net.... imagine if those same worthies had sat down and called for a referendum on a 30K a month minimum wage for all workers or a referendum on a moratorium on slopeland development. Lee Teng-hui also praised Mayor Ko of Taipei last week, another way of helping politicians who are neither KMT nor DPP, but are pro-Taiwan. Ko has been the subject of much griping from DPP politicians attacking him for being pro-China, an attack that is completely absurd. Tainan DPPer leaves DPP to run for Taipei Mayor. Yawn. Polls have current Mayor Ko ahead of all comers, he will likely win if the DPP supports him. Over in Taoyuan the Wu family princeling isn't going to challenge the popular and effective DPP mayor, meaning that the DPP will more than likely keep Taoyuan. The 8th Global Forum on Modern Direct Democracy will take place in Taichung Oct next year. First issue of International Journal of Taiwan Studies online! China lashed out at US over Taiwan travel act. Julian Ku has a good explainer here. The business cycle is still in the upswing: ICRT reports that Taiwan's export orders for January rose more than 19-per cent from a year earlier, marking the 18-th consecutive month of year-on-year increase. 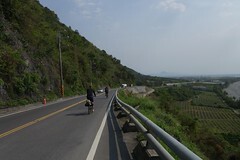 A "bikeway" in Fengyuan. All the government did was mark the motorcycle lane as a "bike route". I bet somewhere this has been collected as a kilometer of "bike route". 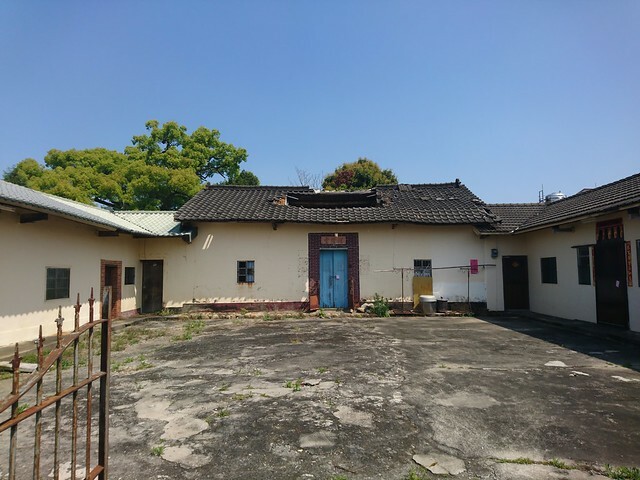 Another chapter in the unfolding saga of the Kaohsiung city government vs the residents of the old military village housing where our restaurant is located, which is slated for demolition later this year, to make way for a reconstructed Qing Dynasty city wall and moat. Those without legal title to the land are being offered the government assessed value of the bricks and mortar of the structure they live in, and even those with legal title to the land are being offered a pittance for their land in addition to the value of the bricks and mortar. In neither case is the money sufficient to buy even the smallest studio apartment in the crappiest building in the far suburbs of the city. Many of the residents of this area are retired working class folk living on very limited incomes, and may not be able to afford to rent once their houses are taken from them. So residents are understandably extremely upset and have organized in various ways to oppose the city's plans. Recently city officials have visited everyone with businesses in the affected area to discuss moving them to a nicer location where they claim there will be more foot traffic. Of course these locations conveniently also belong to the city and rent would be charged, payable to the city, although it is quite reasonable rent - probably somewhat below market. This next bit is just hearsay, but we've been told that they have also approached some of the key organizers and most vocal community members and said don't tell anyone, but we will work with you, just you, to line up a place to live which you will own outright, if you stop your involvement in the community resistance. To add insult to injury, the Cultural Affairs Bureau is supporting a spectacular multi-million NT$ local opera performance this weekend on the already reconstructed part of the wall next to us, and are opening a new museum in the park behind us, also this weekend. So they have lots of money to splash around for big events, but apparently not to properly compensate people who will be left homeless once their houses are taken later this year. Apparently the central government has provided an enormous subsidy, but the city government is loathe to spend it on giving these people a way to live.